Dorkbot CBR is on again! On 17 Sept, we warmly welcome Wellington based artists Kura Puke and Stuart Foster who will be joining us on Skype to talk about recent projects and ongoing collaboration. Kura and Stuart both participated in the SCANZ2013 residency, creating a number of works, which we look forward to discussing. Tipi Nga Rangi by Kura Puke and Stuart Foster. 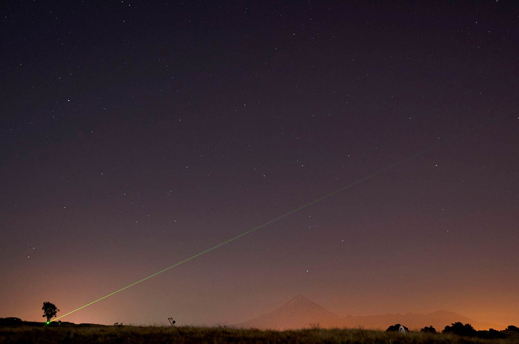 This image of the laser being tested was taken during the SCANZ2013. Photo by Kalya Ward. They were also recently awarded the Intercreate Media Arts Project 2014. Kura Puke (whakapapa: Te Ati Awa) has a BFA in Fine Arts where she majored in glass and holds a Masters in Maori Visual Arts. Puke utilises LED (light emitting diodes) and fibreoptic thread to create illuminated works. The combination of traditional elements and seemingly commercial materials and technologies, bring together new and ancient knowledge transforming urban visua-scapes into vital, responsive and communicative spaces culturally relevant and resonant within Maori and bi-cultural communities. Puke’s last significant work Muramura developed out of her investigation into how Maori visual culture continues to reflect customary values, to remain relevant and to resonate withing increasingly urban realities. This work comprised of 12 tukutuku panels which featured animated patterning with variable patterns, timing, intensity and colour. New developments are ongoing including solar power and sensor capabilities. Stuart Foster is a spatial designer and academic based in Wellington. Stuart lectures in the spatial design programme at the College of Creative Arts, Massey University, specialising in digital interaction, digital fabrication and spatial representation practices. His research focus is on interactive technologies that operate between digital and physical environments. Other research interests include the exploration of new digital fabrication technologies and how they may be exploited within design process. Stuart is also a founding member and creative director of interrupt collective www.interrupt.co.nz. Entry filed under: meetings, skype, speakers.